Gent In the crypt of the Sint-baafs Cathedral is Saturday, the official start of the construction of a new visitor centre for the Lamb of God. “A crown that will continue to shine on the Ghent heaven”, said Ludo Collin, rector of the Saint bavo Cathedral. The Flemish government invests 4.3 million euros in the project. 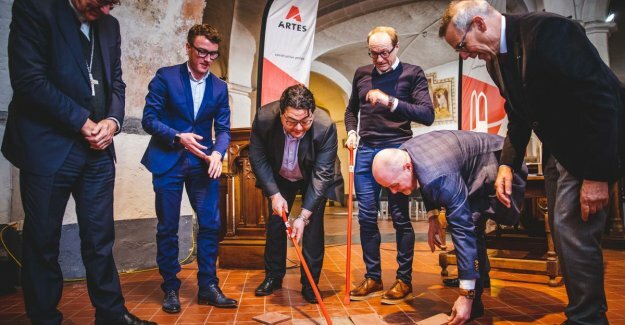 With the outbreak of the first tiles in the crypt ensured the Flemish minister for Tourism Ben Weyts (N-VA) and the Ghent aldermen of Culture Sami Souguir (Open Vld) and Tourism Bram Van Braeckevelt (Green) for the symbolic start of the construction works on the new visitor centre. The new visitor centre is next to the exhibition Van Eyck. An Optical Revolution in the MSK in the heart of the Van Eyck-year in Ghent in 2020. The end date of the works is planned for June 26, 2020.